Hyundai Santro is back after a period of four years in India. This time, the car is more prepared to take on competitors in the segment. Hyundai had stopped the production of Santro to promote its Grand i10 and Elite i20 models. But now when the tall boy Santro is back, it will interesting to watch how better it falls on the expectation of its buyers. Nearly two decades ago when Hyundai launched its small car Santro in India, it had received accolades for its eye-catching design and attractive look. No sooner, it became the highest selling car in the entry-level hatchbacks segment. The new Hyundai Santro 2018 seems to have retained its legacy in terms of design which also focuses on young buyers. If we discuss the front design of new Santro 2018, you can clearly notice an aggressively designed signature front grille, dominating the persona. The use of character lines and creases from nose to the tail of the car makes the design more interesting. As compared to Grand i10, its headlamps are more curved and stretched. The new car looks prettier with body colored OVRMs and integrated LED indicators. It has been unveiled in 7 colour shades. The rear side of the new Santro looks somewhat similar to the Grand i10 car from the same stable. The new Santro car has a ground clearance of 160mm which is less than its nearest rival Renault KWID with a ground clearance of 180mm. In totality, the car's exterior design seems to satisfy a young customer’s interest as buyers seeking a small family car. 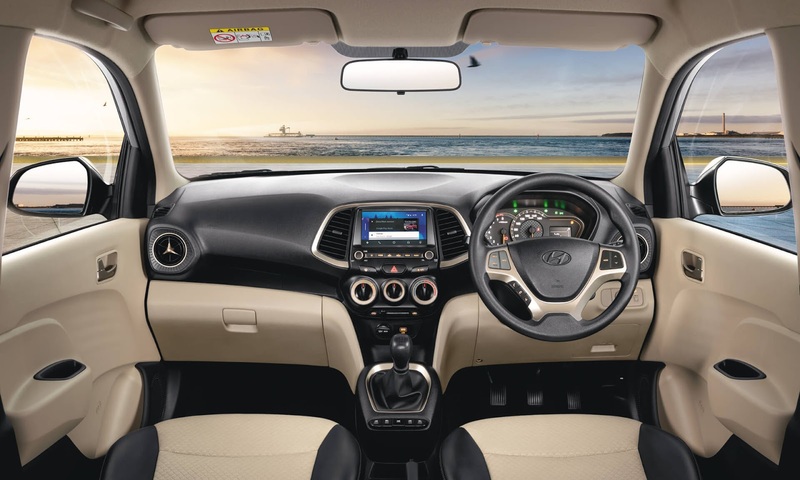 The new Hyundai Santro has received an enhanced, stylish and spacious interior. It reflects an intelligent blend of the interior of Grand i10 and Verna. The quality of plastic may disappointment you but considering, value for money, it is not bad either. There are many interesting changes that will lure you. The unique propeller design of the AC Vents, two-tone dashboard, and gear lever has a premium look. The car also has been given rear AC vents which is the first in the segment. It is also the first that any car in this segment has been given a 7-inch touchscreen infotainment with a support for Android Auto, Mirror Link, and Apple CarPlay. The car comes with features like driver airbag, ABS and EBD as standard i.e. in all versions. The car could have been even better if it had driver seat height adjust and tilt steering wheel. The higher seating position in new Santro makes getting into and off comfortable. It also gives a better view of the road. There is plenty of leg room for the passengers at the rear seats. The rear flat seats can easily adjust 3 passengers comfortably. Its cabin entry is also less painful for elderly people such that they don't have to crawl to get inside the rear seats. s compared to the classic Santro model, this one is longer and wider. The headroom is also satisfactory, and can easily accommodate a person with an average height of 5.5 inches or so. The car's cabin has also been given ample space and pockets for water bottles, paper cups, and other small stuff. It has a 235-liter boot space which can easily accommodate two medium size luggage. 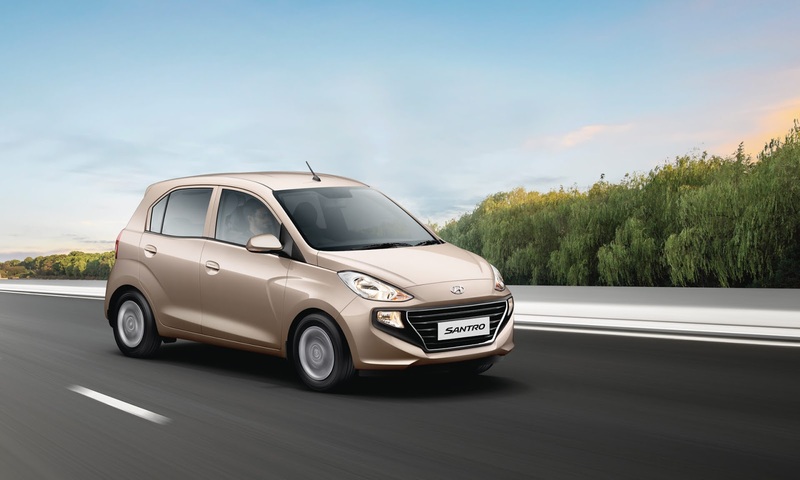 While other cars in the same segment have been a 3-cylinder engine, the Hyundai Santro 2018 model has been introduced in the 4-cylinder engine 1.1-liter engine. The new Santro car has been introduced in five variants for petrol (manual) version and two variants for each petrol AMT and CNG (59 PS) manual versions. The engine of new Santro generates an output of 69 BHP at 5500 Rpm and 99 Nm of torque at 4500 Rpm. The cars 1086 cc engine delivers nice performance on the road however if you seek more power Grand i10 still seems a better choice. It is attached to a 5-speed manual gearbox as standard and an optional AMT gearbox. The Hyundai hatchback car can hit a maximum top speed of 156 km/h. As far as fuel efficiency is concerned, this car returns a mileage of 20.3 Km/l. The CNG variant has been installed with an 8 kg of tank capacity and delivers 30.48 km/l of fuel economy. The AMT variant is another surprise element in the offering of Hyundai Santro 2018. The company has developed this Smart Auto AMT variant 'in-house' keeping in view of its 1.1-liter engine. It performs better than other AMT cars in the same segment. The car performs identically similar in both city and highway conditions. The AMT variant comes relatively little more expensive than its manual variant but is quite helpful in city traffic jams. 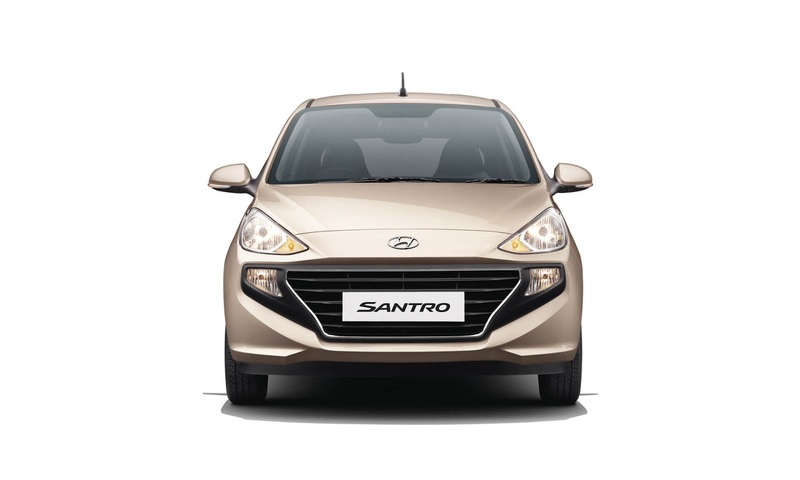 The new Hyundai Santro places itself as an affordable car for buyers who do not want to go for Grand i10. It directly competes with Renault KWID, Maruti Celerio, and Tata Tiago and new Datsun GO. The new Santro model seems to have an edge over its rivals in terms of design, features and build quality. In essence, Hyundai has tried to include many features in the new avatar of Santro whose price begins from Rs 3.89 lakh. Will this new Santro be able to regain the popularity and position it once used to control? Only time can tell! Author’s Bio - Himanshu Jha is a blogger at www.reviewtalks.com. He also loves to blog about the latest happenings in the automotive world, car launches. He occasionally writes reviews on newly launched motorbikes and cars.